A man in his seventies is alone at sea on a 39-foot yacht when it accidentally strikes a cargo container floating in the ocean, wounding the side of the boat. This is the story of a man’s fight for survival while lost at sea. The idea of a film centered entirely around one actor being the only star in the entire film will be interesting in and of itself to some viewers and repellant to others. Few actors are probably worth watching act on screen by themselves for close to two hours, but movies like Cast Away, which largely centered around just Tom Hanks for most of the film, prove that, if done right, it can work. However, with J.C. Chandor’s All Is Lost, the film is truly a one-man show from start to finish. And the 77-year-old Robert Redford is Our Man. “Our Man” is Chandor’s official title for Redford’s character. We don’t know much about him, aside from a brief monologue in the first scene where we hear his voice citing a farewell letter to unidentified family. “Our Man” isn’t ever given a name, and it’s Chandor’s intent that Redford’s character is “the every man;” he could be any one of us, alone, lost at sea during the final chapters of our life. We don’t know exactly why he is sailing or sailing alone, we don’t know his family history, his personality, what he once did for a living, or really what kind of man he is. This makes it very open to interpretation, but it will definitely be a stumbling block for some viewers who may have a hard time connecting with him because of it. The concept of the movie and the fact that Redford is such a great actor is what drew my interest in for this movie. However, 20 minutes into the film, I found myself thinking “OK, there’s no dialog, we’re just watching him try to fix the side of his boat and repair a waterlogged radio… how is this going to be interesting for an hour and forty five minutes?” But the truth is, Redford and Chandor make it work. I found the story gripping because, for one, you know bad stuff is going to happen, you just don’t know how or when, and you also don’t know how this story will resolve. And Redford plays “Our Man” with such confidence and believability that you never feel like you’re watching an actor act; it really feels like you’re along for the ride as an almost-80-year-old man fights for his life. There’s no inner monologue, he never talks to himself, there’s just Redford, his acting and reacting, and the incredible sound that All Is Lost surrounds us with (thanks largely to Skywalker Sound). It’s a performance like this one that reminds you just why movies with really poor acting just plain lack. Acting is incredibly paramount for making a film work. There’s so much that All Is Lost could have been, though. One major complaint about Cast Away is that it was bland; the movie was about a man stranded on an island for years, fighting for survival and a way to get home. It lacked deeper substance, unfortunately–and it was too long. All Is Lost keeps things interesting visually and thematically, and it gives viewers an ending that Chandor insists is the viewer’s own to interpret. I automatically took it as a literal interpretation, but in the commentary, Chandor says he wants the viewer to receive it however they’d like. While I’d love to know his own take on it (i.e. what it means to him), I thought the ending was just about perfect for what the movie leading up to it was. But the lack of at least inner monologuing or backstory for “Our Man” makes it tough to grab a really deep hold on the character. But, amazingly enough, Redford has the acting chops to wear the unheard dialog on his face alone. He isn’t constantly cussing under his breath about his circumstances, he isn’t calling out “Why me? !” and he isn’t thinking out loud. He’s a man (and a resourceful, strong-willed one at that) fighting to survive and come to grips with the potential last moments of his life. That alone is a heavy concept and Redford takes it and sprints to the finish line with it. He’s brilliant in the role. The content is just barely PG-13 rated. The only definite language in the movie is 1 use of “God” as an exclamation and a loudly yelled use of the “F” word. It’s kind of apparent that it was used solely to make sure the movie wasn’t given a PG rating, but it really didn’t even fit in the movie. If there was one scene where I even remotely thought “I can’t really see him doing that,” it’s this man using every ounce of strength to stammer out and then scream the “F” word in desperation given his circumstances. There seemed like dozens of other moments where I could see the character wanting to utter the word, but he said nothing instead. And then the time it is finally used, and the way he delivers it, was really the only moment in the film that I felt was out of place or detracted (That is, aside from some very noticeable green screen work, but this film was executed on a very limited budget and still turned out fantastic). Otherwise, the only other content worth mentioning is that he gets a bloody gash on his forehead at one point and in a following scene, we see him pushing on the cut to put butterfly bandages over it. All Is Lost is most certainly not everyone’s cup of tea, but it’s an excellent film that works mainly because of Robert Redford’s incredible performance and skilled directing by J.C. Chandor. The soundscape that the filmmakers paint to fill in for the lack of dialog is equally wonderful. While Alex Ebert’s sparse score sounds slightly dated, it does work with the movie, for the most part, when it’s used. It’s an engaging film for cinephiles first and foremost, and for anyone who’s experienced the intensity of sailing on their own. This isn’t your usual brand of entertainment; All Is Lost is the Gravity of the ocean, without the frills and 3D visuals to tickle your senses. 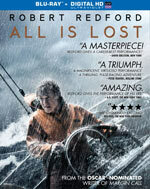 If you love incredible acting and want something a little new and different to watch, find All Is Lost. The Story (3:45) – Redford and the crew talk about the story, the purpose of the story, not naming the main character and how J.C. wrote it with Redford in mind. The Filmmaker: J.C. Chandor (3:17) – Here, Redford and the crew talk about J.C, his methods, what it was like to work with him and his vision for the movie. The Actor: Robert Redford (4:25) – Here, everyone again talk about Redford, his role as “Our Man” and how it was written for him. 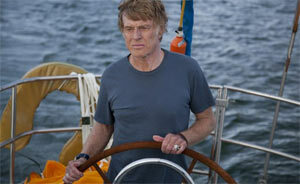 Redford says he “gave himself over” to J.C. as a director, entrusting his vision for the movie. Redford has become an acclaimed director and he wanted to just be an actor again for this movie. Big Film, Small Film (6:11) – This was all about the production of the film and how big the production team was for such a small indie film. Preparing for the Storm (7:58) – J.C. narrates his process in making All Is Lost — from storyboarding the entire film out first to even recording some pre-production example scenes with just him and another film crew member while on the lot (and we see some of this footage here). It’s fascinating to see how it all came together. Vulgarity/Language: 1 “F” word (screamed as “F- F- F***!”); 1 “G-d”; There are some other quietly muttered sounds to himself that might be 1 or 2 uses of the “S” word, but they’re barely audible and not defined. Alcohol/Drugs: He drinks some alcohol in a glass and then pours himself more; We later see him having another glass with dinner; As he closes up stuff in his cabin, we see several more bottles of alcohol. 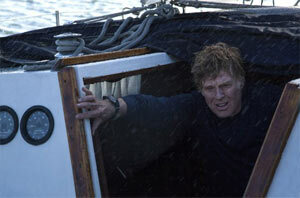 Blood/Gore: While the storm tosses the boat with him inside, he falls and hits his head on a pole, getting knocked out. When he awakens, he has a bloody gash on his forehead. In a later scene, the camera focuses in on him pushing the cut together twice as he puts butterfly bandaids over it. As the movie progresses, we occasionally see the cut as it’s healing. Violence: Given the nature of the movie, most of these are SPOILERS: His boat hits a cargo container and it busts a hole in the side of his boat. Water pours in; A storm knocks him off his feet a few times below deck; He’s pounded by the waves on deck and knocked off the boat into the water; We see him throw up in the sink. It’s probably just some water he inhaled, however; The boat capsizes with him inside and we see him and everything inside tumbling around. The boat then turns over again; A wave knocks him off his boat and it turns over; A wave rocks the boat and it knocks him into a pole inside his cabin. He then falls over onto the couch, unconscious; A storm tosses him in his raft and it starts to sink; He tosses a tin can in anger and then knocks over a bottle of water; He tries to fish at one point and gets a nibble on the line, so he pulls it in but it turns out to be a shark that lunges at the side of the raft; SPOILER ALERT: He starts a fire in a plastic can to be visible to a nearby ship and the fire rages out of control and takes over his raft, and he falls in the water; BIG SPOILER: He exhales purposefully and lets himself sink. He sinks for a while and then sees a rescue boat on the surface and then swims toward it. He grabs a hand reaching into the water and the movie ends, leaving it up to interpretation that he either survived or died and the “rescue” was the afterlife.